•	Crunchie had been aiming for a total of 10 million views for the lenses. Its first attracted 9 million views alone- suggesting it has smashed its targets for all three campaigns. Sales of chocolate snacks have been declining in recent years, so Cadbury’s needed to boost sales of its ‘singles’ bars – Wispa, Crunchie, Boost, Double Decker and Twirl – to a new, younger target market. The marketing push is part of Cadbury’s long-term “Obey Your Mouth” campaign, which launched on May 11. Of Snapchat’s 100 million active users, about 55 million are in the coveted 16 to 24 age range. According to research firm Canvas8, 40 percent of teens in the U.K. are on the platform. bAs a result, Cadbury has spent half of Crunchie’s digital budget on Snapchat— its top platform after TV and online video. To create a Snapchat Lenses ad, advertisers and agencies need to spend time working with the apps developers and ad sales team to make their Lenses happen. They can't just re-purpose their other online ads and make a quick decision to buy. Instead, advertisers and agencies submit their ideas to Snapchat, which goes ahead to create mock-ups of the animations itself in-house, which then go back to the brands to approve. Snapchat Lenses can also be used without sound, so creative ideas need to translate without any explanation. As a result, Cadbury opted to make its lenses humorous with the novelty factor of seeing your face turned gold or having giant lips. 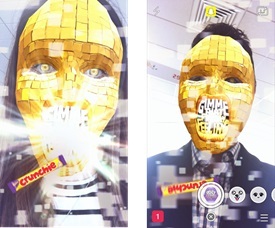 The brand created three different lenses for the Crunchie campaign. In keeping with the bar’s “Get That Friday Feeling” tagline, these were released to users over the last three Fridays in May. Cadbury’s creative stage took around two months, while the engineering on Snapchat’s side took around three weeks, as all its production is done in-house. Jerry Daykin, global digital partner at Cadbury's agency Carat said: "Lenses drive significant reach of an audience you would struggle to buy on TV. When you get it right, the average time people use [a Lens] can go up to a minute; it's very personal and very energetic." He added that some influencers, including Zoella, shared the Creme Egg Lens with their followers, adding even more earned media that Cadbury didn't even need to buy.